The Nikon D7000 includes live view capability with one-touch activation, via a dedicated Live View switch on its rear panel, in very convenient reach of your thumb. Flick it at any time, and the mirror flips up, with the camera immediately entering Live View mode. A button at the center of the Live View switch is used to start and stop movie recording..
A nice feature of the Nikon D7000's Live View mode is the optionally available, full information display. The Live View mode shooting info display shows you a lot of what you'd normally see looking through the viewfinder, yet manages to keep most of the information out of the way of the live image area. Information displayed includes current exposure mode, flash mode, AF mode, AF-area mode, Active D-Lighting mode, image size, image quality, white balance mode, metering mode, shutter speed, aperture, exposure compensation, ISO setting, shots remaining, face detection status, and battery status. In a separate overlay mode, it also shows microphone status and minutes/seconds of movie recording available at the current resolution and quality settings, and indicates the area of the frame that will be outside the movie crop by darkening it. There's also a third info overlay that only shows basic exposure variables, as well as a grid overlay display, and a single axis (roll) electronic level display, all of which include small crop marks to indicate the movie capture area. A very nice detail is that you can adjust the LCD monitor's brightness (with no effect on the exposure / brightness of captured images) without needing to enter the camera's menu system. This is achieved by holding in the Help / Protect button,and pressing the Up or Down arrow keys on the four-way controller. It's a clever design, because when shooting in live view mode, you can find yourself often wanting to change the display brightness as you roam around taking photos in varying ambient lighting conditions. One thing we miss in the Nikon D7000, though, is the live histogram display that's an option on the Nikon D3 and on some competing SLRs from Nikon's rivals -- even in some entry-level cameras. Like the D90 and the company other subsequent DSLRs, the Nikon D7000 has only one type of autofocus method in Live View, and it's not the traditional phase-detect AF. 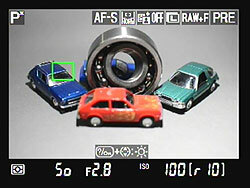 The D7000's only option for autofocus in Live View mode is contrast detection. This is a fairly radical difference, compared to other camera makers. By way of explanation, the phase-detect/contrast-detect distinction is one of the fundamental differences that separates digicams from digital SLRs, and is the core reason that SLRs focus more quickly. Contrast-detection autofocus involves looking at the image from a camera's main image sensor and evaluating it to see how abruptly brightness values change from one pixel to the next. If an image is soft and fuzzy, brightness changes between adjacent pixels will be relatively slight, but if it's sharply focused, they'll be much greater. The point of ideal focus is found by moving the lens elements back and forth, and determining whether the contrast signal gets stronger or weaker. Achieving focus this way necessarily involves some back-and-forth hunting, which can take a while to accomplish. By contrast (no pun intended), phase-detect AF uses a system of prisms, lenses, and a secondary sensor to determine not only whether the image is in focus or not, but by how much it's out of focus and in which direction. The camera can then adjust the focus setting to exactly the position needed, either in a single step, or perhaps with a quick secondary check once the initial focus adjustment has been made. As a result, phase-detect AF systems are generally much faster than contrast-detect ones. The catch with phase-detect AF, though, is that it requires some of the light passing through the lens to be diverted to the focus sensor. This is fine in an SLR, when the mirror is down between exposures, as typically part of the mirror can be made to be partially transmissive, with the light passing through it deflected by a secondary mirror down to the AF sensor, usually located in the bottom of the mirror box. When the mirror is raised in Live View mode, though, light from the lens can't get to the separate AF sensor. This accounts for the rather lengthy (and noisy) phase detection AF cycles in most Live View-capable SLRs: To focus the camera the mirror has to be dropped, focus determined, and the mirror raised again, adding several tenths of a second to the normal non-Live View shutter lag. For example, when shooting with our Sigma 70mm f/2.8 prime lens, the Nikon D7000 has a shutter lag of only 0.238 second when using the optical viewfinder and a single AF point. This increases to an average of 1.95 seconds in Live View mode via contrast-detect, all other settings being the same. While it takes some time for the mirror to drop and re-open for phase-detect AF in Live View mode, the overall result can still be faster than when relying on contrast-detect autofocus. The Nikon D300 for instance can focus and capture a shot in 0.473 second in Live View mode using phase-detect AF, with the same Sigma lens. With the above as background, you can see why we were surprised to find contrast-detect AF the only autofocus option available on the D90, and continue to be surprised that they've carried that limitation forward on the Nikon D7000. It's a little bit faster than its equivalent in the D5000, but the Nikon D7000's contrast-detect AF in Live View mode clearly still isn't something you're going to be using for sports shooting. As shown here, one advantage of contrast-detect AF is that you can put the AF box wherever you like it. (In this case, we've put it top center.) When focus is locked, the focus box changes from red to green. One advantage of contrast-detect autofocus, though, is that you're not restricted to focusing only on those areas where you happen to have an AF point. 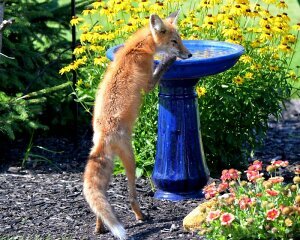 The Nikon D7000 lets you put the focus box anywhere in the frame when in Live View mode. Contrast-detect AF also opens the possibility of advanced modes like face-detection. The Nikon D7000 will change both the location and size of the face-detect box to accommodate changes in subject size and position, and can detect up to 35 faces in a scene simultaneously. Besides the ability to position the AF area wherever you like it, the Nikon D7000's contrast-detect AF in Live View mode also offers face detection. Up to 35 faces can be detected in an image in Face Priority mode, and the AF areas adjust to match the size of each face detected. The primary face-detect box shows yellow when not in focus, and green when in focus (after half-pressing the shutter button). The video clip at right shows the earlier D90 model tracking a live face while zooming in and out and panning around. While the Nikon D7000 can detect many more faces simultaneously, its face detection autofocus mode is otherwise very similar. Face detection. 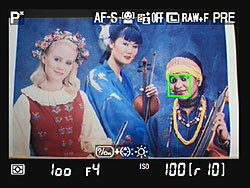 Here's a look at the D90's face detection working with a live subject, which operates similarly on the Nikon D7000. Click to view/download 1.7MB MPEG-4 file. Other Nikon D7000 Live View autofocus modes are: Wide Area, designed for hand-held shots of landscapes and other non-portrait subjects; Normal Area, designed for pin-point focusing using a tripod; and Subject Tracking. This mode is designed to track just about any selected subject as it moves around the frame -- it need not have a face. During manual focusing, the Live View display on the Nikon D7000 can be magnified quite considerably, but it seems it's not all that you might expect from the specifications. In Live View mode, pressing the magnifying glass button on the camera's back lets you zoom in up to a maximum of 6.7x. The viewfinder image at this magnification isn't sharp, though; it seems the camera is actually grabbing fewer pixels than that section of the sensor actually contains and then interpolating them to form the image. (You can check this by snapping a shot and then magnifying the resulting image to the same degree in playback mode. Doing this, you'll find the image is quite a bit sharper than what you saw on the LCD in Live View mode.) While the magnified Live View display is still usable for focusing, it isn't as sharp as it could be, nor as sharp as the Live View display on some of Canon's SLR models sporting this feature.